Breakfast has always been my favorite meal of the day. Unfortunately it's also the most neglected and the least thought about for most people, myself sadly included. So on weekend mornings, after sleeping in the for the first time all week, I almost always wake up craving a warm home-cooked breakfast. This is no more true than when the seasons change in the Fall. These pancakes represent all that is good and cozy in the world. I've made some version of them nearly a dozen times. 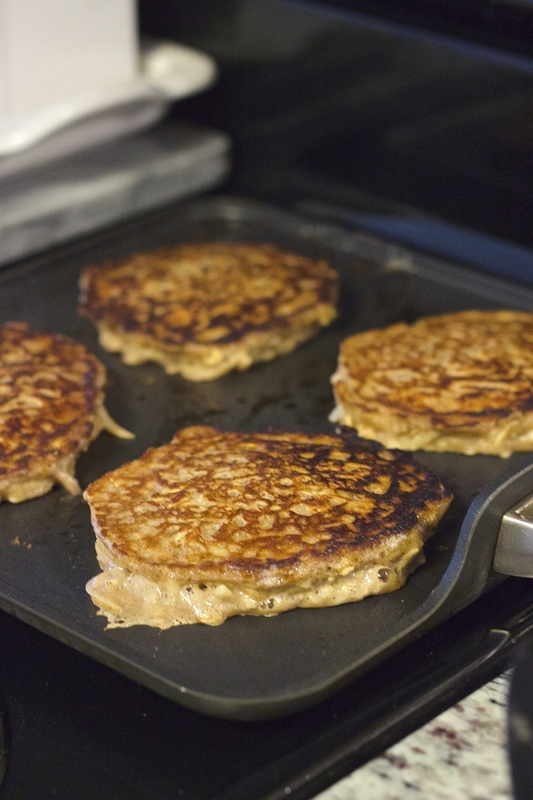 They are chock full of so much freshly grated apple, we endearingly refer to them as apple latkes. They are spiked with fresh apple cider (bonus points if you get it from a local farmer's market!) and sweetened with real maple syrup. They have just enough oats to make them filling and hardy. Perfect for lazy Sunday fall mornings. In a large bowl combine the milk, cider, eggs, vanilla, and maple syrup. Peel and core the apples then grate them using either the grating attachment of a food processor or a box grater. Measure out exactly 2 cups. (More and they had trouble cooking through). Set aside. In a medium bowl whisk together the flour, oats, baking powder, cinnamon, nutmeg, allspice, and salt. Pour the dry ingredients into the wet ingredients and stir until just combined. Add in the apples and stir until integrated. Warm a fry pan over medium heat. Once hot, add a thick slice of butter to the skillet and top with 1/4 cup dollops of batter. Flip once brown and crispy on the bottom. Continue with remaining batter, adding butter each time. Serve hot!